2015 I WRAPS I 37 A s if wrapping a vehicle isn't challenge enough. Things get even more complicated when you consider all of the new graphic film products hitting the market—from 3M 1080 to all the various window films, and even new DI-Noc carbon fiber films. The product choices are almost endless, and when you toss in the fact that materials are designed for different substrates and pose their own unique installation demands, installation can become quite confusing. Even seasoned installers find themselves asking, "What kind of material is this, and how do I install it correctly?" Where do you begin? It all boils down to high- quality education. In today's wraps world, installation training has become a very important tool for installers and manufacturers alike. Everything from finished product appearance to warranty issues come into play, and unless you know the correct techniques for installation, you will surely run into trouble. How to Get Training Once you decide you need training, where do you turn? 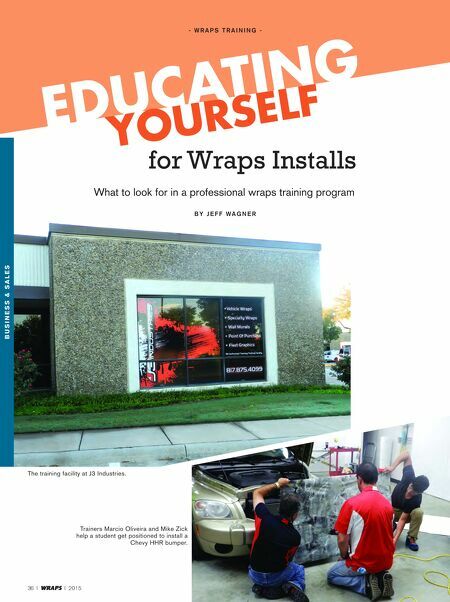 The obvious solution is to pick up any wrap industry trade magazine (like the one you're holding) or surf the net for a while and anyone can come up with at least a dozen companies or installers that advertise training at some level. (See page 132 for Wraps Training Resources.) Knowing what to look for in a trainer/ training program can mean the difference between learning crucial career-changing skills and wasting time and money on knowledge you already have. Selecting the Right Course Deciding on a course can be the most difficult part. First thing to look at is the course content. Do your research on what exactly they are teaching and compare that to what it is you feel you need to learn. It would be counterproductive to attend a class on car wrapping to further your knowledge on wrapping for truck fleet graphics. Make sure the class is equal parts material selection, surface prep and installation instruction. All are key components to good graphic application. Check to see if the class has any manufacturer affiliations. Most shops that do also have a never ending supply of product support and information. With that kind of support, the latest techniques and materials are no more than a phone call away. This will come across in the information you receive and retain. Location, Location, Location Where you attend your training can be a very important part of your decision too. Find a place as close to your home territory as possible. If you live in a northern U.S. state, for example, regional trainers who are used to wrapping for severe winter conditions may have specific tips to help with wrap durability in your area. Additionally, if you don't have to travel far, you can relax and enjoy the learning experience without the added travel stress. Look for a location close to amenities such as hotels, travel and restaurants. This might seem like a trivial detail, but things like this can add or detract from you training experience. Cost Factors Cost can be another factor in your decision. Don't let the possible high price of training deter you. There are classes and instruction materials that are available to fit any budget. Let the content, location, availability and length of the course help you determine what's best for you—and how much you want to spend. If the class is structured correctly even a less- expensive courses can be very effective. The Right Instructor Now for the big one: The Instructor. He or she is the most important aspect of your training. Look for someone with appreciable real-world experience in wraps graphics installation. Ask for references and look for training certification programs such as those offered by 3M, PDAA, Lowen and Fellers. "Bringing real world experience into the classroom" isn't just a slogan that I use for my business, it's the motto that Jeff Wagner is the owner of J3 Industries in Addison, Texas. He has been a graphics installer for 23 years, and his company is one of the newest 3M authorized training and testing facilities in the country. Trainer Mike Zick demonstrating vinyl removal at the Corrugated Panel station. The diagram shows the different parts of a corrugated piece.